This isn’t the first time Obama has called himself as a feminist; during a June summit at the White House, he first fully embraced the moniker of “feminist,” using the old phrase, “this is what a feminist looks like,” as he addressed persistent obstacles—like maternity leave and equal pay—in the project of gender equality. 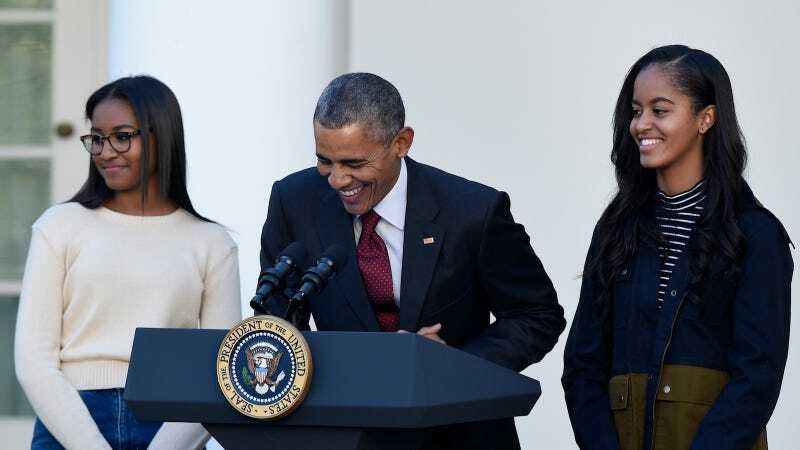 In that speech, like his Glamour article today, Obama framed feminism in the context of the family, speaking about his daughters, again, and feminism’s relationship to fatherhood. Here, the President pays witness to the reality of women’s work, the fits and stops of careers impacted by real tangible gender discrimination, as well as the often invisible labor of motherhood, particularly by black women. Obama reflects on his own role in the continuation of that invisible labor, delineating the stereotypical expectations that often underpinned his own concepts of marriage and parenting. The piece is fine and there’s very little for men or women to disagree with: gender stereotypes are, indeed, bad. And it’s undoubtedly important for girls across America to have a diverse set of role models, “I want them to know that it’s never been just about the Benjamins; it’s about the Tubmans too,” Obama writes. Obama’s short essay is certainly trying to make a neutral appeal of women’s value, but the nature of that appeal strikes as outmoded as the very gender stereotypes he addresses. In the narrative of “dad feminism,” women’s equality is still bound and dependent on their relationship with men. As my colleague Kelly said, “it’s feminism as a lifestyle statement.” And maybe it’s an acceptable way for men to state their feminism, to frame it as one of their many sacrifices as parents and thus reshape feminism as a familial work, stripping it of its radical roots and progressive ideology. But there’s a limited appeal here, one that reinforces women’s worth as deeply interdependent on domesticity. Changing a diaper or two, as the President suggests, is great (though I’m not certain we should “celebrate” men for doing so), as is the recognition of women’s work, but it would be even better if we could have that conversation outside of the boundaries of family relationships.